CNY hits new lows while Turkish crisis weighs more on EURUSD. The support rests at 1.13030 with resistance at 1.13590 which both lines are below the weekly pivot point at 1.14750. The EMA of 10 is moving with bearish bias in the descendant channel and it is below the EMA of 100 and the EMA of 200. The RSI is moving in oversold area, the Stochastic is moving in low ranges and the MACD line is below the signal line in the negative territory. The ADX is showing sell signal. 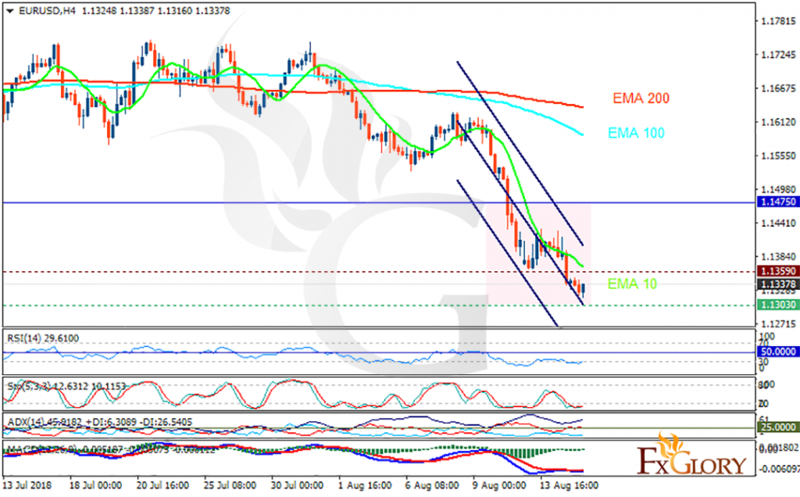 The indicators are showing potential declines as price action is likely to extend down to the 1.1200.